The bargain I made with myself after my tortuous search for the perfect over-ear headphones, for the purposes of meditational escape and overall awesomeness, was that I could also have a pair of decent earbuds as long as they were cheap. (Such things do exist!) Sometimes the Sony MDR–7506s are too big to take somewhere, or it’s just too hot to put big electronic earmuffs on, and buds become necessary. I have before me three highly-regarded such buds in the sub-$35 price range, and I thought I’d give you my quick verdict on them. They are the Logitech Ultimate Ears 500vm (which I will refer to as the “UEs”), which I discovered on my own, and the top two picks of The Wirecutter: the Brainwavz Deltas and the Panasonic RP-TCM125 Ergo Fits (which belong to my wife). 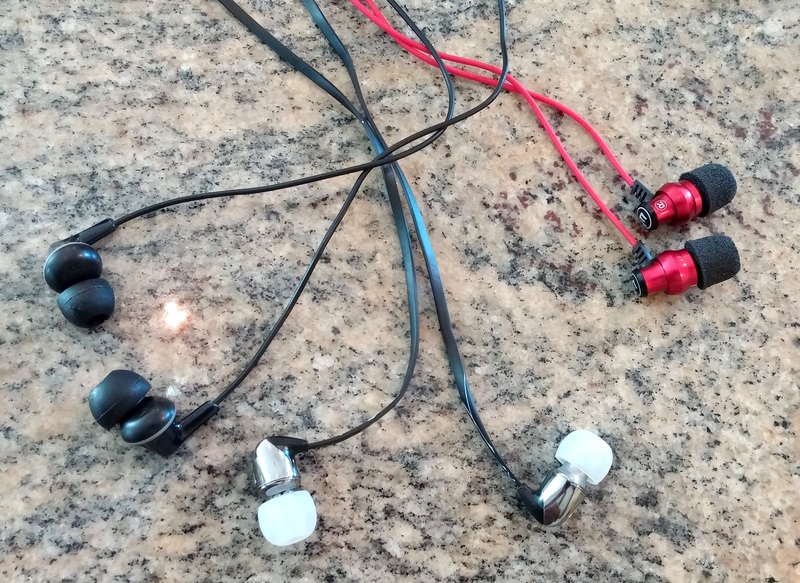 I tested each pair listening to three specific songs, the acoustic version of Seal’s “Crazy,” The Weepies’ “Take it from Me,” to get a little outside of the acoustic sound but not too much, and deadmau5’s “The Veldt” for some straight-up electronic sounds. The UEs first retailed at $80 but must not have sold well, and are now available for just over $30, while I got them for under $20 on sale. They are packaged and presented as a somewhat high-end product, complete with lots of padding in the packaging and a uselessly-small case that takes so much effort to cram the phones into, it’s not worth it. They have but one button for controlling play, pause, and advancing tracks, and, weirdly, a volume wheel, which I just keep at full, and never touch. The UEs were by far the most balanced of the three. They didn’t sound flat or full by any means, maybe “neutral+” would be the way to put it. They kept everything on an even keel with just a touch of “umph” to add to the richness. Details come out pretty well overall, though in “The Veldt” I missed the emphasis on bass that the other two sets presented. The bass is by no means missing, but in most circumstances, the UEs put the bass where it belongs. And if you like a genre of music for its low end specifically, you might miss a little bit of that with these buds. The Ergo Fits, the cheapest of the bunch at about $13, gave much more low end emphasis, though I could still enjoy some detail. They also struck me as the loudest of the bunch. In “Take it from Me” they felt like bass overkill, though they offered what I’d consider a viable alternative output f or “Crazy,” a little beefier than what you’d get from the UEs, but not in the way. The Ergos were probably the best of the three for “The Veldt” specifically, but only by a hair. The Wirecutter currently considers the Brainwavz to be the best earbuds under $40 (costing about $23), which is why I bought them, and frankly I’m not sure why they won. They don’t so much emphasize the bass as simply allow the low end to push everything else out of the way. In “The Veldt” it was acceptable, as it didn’t overpower too badly, but in “Crazy” they definitely obscured the middle range. In “Take it from Me,” the other frequencies are so muffled by the low end that I was frustrated by what I knew I was missing, straining to hear “around” the bass. The one thing I do like best about the Brainwavz is the in-line remote, which is actually designed to work with an Android device (very often headphones either have little functionality in their remote, or default to iPhone compatibility). Now one more thing: What about Apple EarPods? I count myself among the proud and maligned few who actually think the EarPods are pretty good. The worst thing about them to my ears is the lack of a seal; they just sit there and bop around in your ear because they’re simply not fixed in place. I use EarPods all the time for phone calls and podcast chats (I don’t use the built in mic for podcasts, of course) because they give me decent sound and more awareness of what’s going on around me. That’s also why I use them for running, because anything that gives a seal in the ear canal also transmits every movement of the phone cord to my eardrum. For sit-down listening, when I’m not using my Sonys, I go with the UEs. Oh! One more important note. I only bought the Brainwavz because my I thought I’d lost my Logitech UEs, when it turns out they only went through the wash in a pair of cargo shorts. And they went through the dryer. And you know what? You’d never know it. This review is based on my listening to them after the washer-dryer event, so that might tell you something.